A couple of new sketches. The first is a caricature of Canadian caricaturist, Sam Gorrie who I had the pleasure of meeting and hanging out with during her stay in Sydney, Australia. As you can see she was very excited about seeing the koalas. The second sketch is a little bit gory, so if you're not squeamish and want to see the uncropped image just click the thumbnail below. It was done for a Drawing Jam over at The Drawing Board, where each month everyone draws from a few select model poses. This was my interpretation of one of the photos. Mr.Wahl!!!! This is so awesome! Especially the second one! Was that all graphite? Any chance you could check my blog? I kinda did something inspired by you there for my folio, please let me know what you think, before I submit them. Thanks in advance! Yikes I clicked the thumbnail, and was like, freaked out. Awesome work, just fantastic. Haha, awesome. 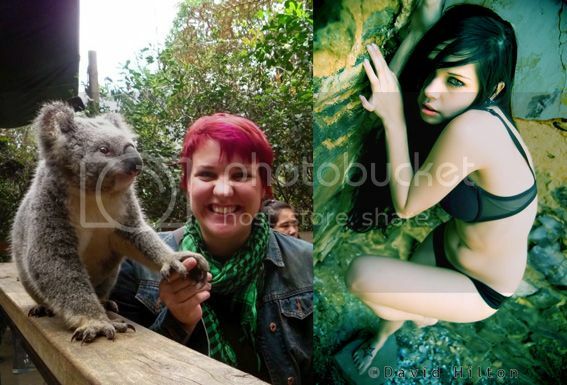 I would be super excited too if I saw a real Koala....unlike the fake Koalas you see everywhere...?!! The Gory image is super cool too and great to see the references as well. Gee- The second one was graphite with simple shading. I then used my custom made brushes to add the textures. inking is awesome. is it digital? i like the shark one too. R. Kamal- Thanks. The self-portrait was hand inked with a Pentel brushpen. Chris, I saw that zombiegirl on the drawingboard forums. Man, awesome work! That is a great caricature of Sam . . . really cool . . . !! She's the one on the right? Good god I love that gory vamp piece. Fantastic work. Patrick- I'm torn as to whether she's a zombie or a vampire. Can she be a zombie vampire? 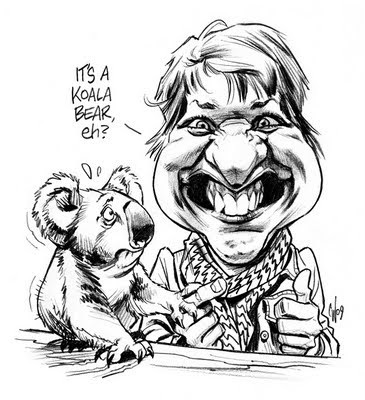 Jason- Funny you should say that, I was tempted to caricature Sam as a koala. Her nose would have lent itself well to the transformation. Jeremy- From a goremeister like yourself that's a huge compliment. Thanks! Very cool Chris!!! The caricature looks awesome!!! Tried to email you the other day did you get it? Patrick- Sorry mate. Got your email, just been a bit busy to get back to you. I'm interested and I'll send you a quote soon.